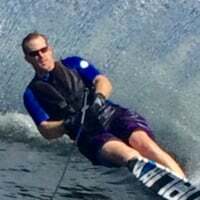 Ski Size - Up of Down? If you are right in the middle of the recommended ski size, which direction would you go? Up or down? I weight 190 pounds. For an HO S2, the chart says a 66.5 is for someone 160-190 pounds. A 67.5 it says is for a 190 and up person. So if you are 190, which one do you go? My personal best is 3 @ 32 off. I ski 34 mph. Some may disagree; but it's more feasible to tune a slightly over-sized ski to ski shorter, rather than a slightly under-sized ski to ski longer. Additionally if the ski is slightly undersized, it may shut down a bit too early in the pre-turn. I just got a 67.5 but I weigh 212 right now. My goal is to drop to 190 - 195. If you're already at fighting weight id lean toward the 67.5. I would have to agree with Gloersen about adjusting to fit. In the short time I've been on it I can see how a minor binding move can dramatically impact the way the ski turns. I was at stock settings and was feeling that it had more of a cadillac type turn. I moved the binding forward a smidge and it started turning real well! I'm very impressed with the ski! It's very user friendly and doesn't require impeccable handle control to ski a wide and early line. This time of year I stay at 28 off for what seems like forever so I can't comment on anything shorter for now, but I can see that (for me) the S2 has great potential! If you ski in warm water, say over 85 degrees I'd go up. Below 85, I'd go down. Rode a 66.5 S2 for a week with winter fat at 187. Summer will be at 175-180. Ride was fine at my weight but thats about as big as i get. Completely agree and experience same boot placement issues as stated above. If u typically stay at 190 and above go up. If you typically drop 10 go down. Hight also maters. If above 6'2" go up. Up for sure. I spent the best part of the last 2 seasons going nowhere. went up a size on a new ski this season, best decision I have ever made in regards to equipment. Up. No doubts. Especially if under deep 38 off. Up. These days it seems carrying speed efficiently is the goal. Maybe too much of a good thing, but for a little while even some pretty light people were using the 70" CDX, w/ some success. I would say up as well Garn, less work and more speed. 67.5 for sure at 34. It will carry more speed through the turn which is in harmony with ZO.